MentorMob allows you to create annotated playlists of web content. You can collaborate with others as you create your playlists or fly solo. In alpha, registration to MentorMob is free (though there is a pro version). The tool lets you present content in a strip form so that learners can proceed from one step or information chunk to another. 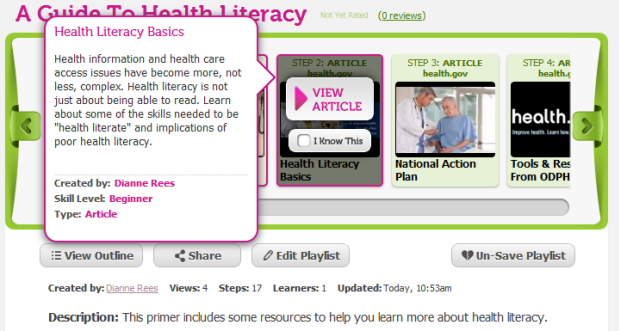 Start by identifying a playlist title and adding a brief description outlining the goals of your playlist. Then identify a category and add tags to help people find what you’ve created. 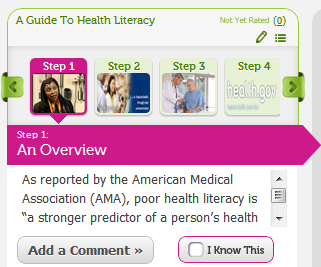 You’ll be asked to add a brief description of the information you’re sharing at each step. You’ll also identify the skill level of the content (beginner, intermediate, or advanced) and confirm whether your content’s an article or video. Finally, you can select from a limited number of thumbnails, an image you’d like to display for each step. You can edit steps at any point and move them around on your playlist. If you’ve invited collaborators to edit your playlist, they can provide comments or notes about changes they’ve made. When you complete your playlist, viewers you share it with will be able to see your annotations as they scroll along the playlist. Change titles to make them short and informative. Make it clear what each step’s about. Limit the number of steps in your strip. (You’ll get a polite warning when you go over ten steps that your playlist may be too long for easy browsing). You can share your playlist by sending out a link, or post it to any of a number of social media sites. You can also embed your playlist on a web page. A brief overview of MentorMob is presented in this video. Because the platform guides you to present content in a step-wise fashion, you do have to think a bit about your instructional strategy. However, certain types of content seem ideal for playlists. If you’re providing resources to help people solve problems, it’s worth paying attention to scaffolding, introducing learners to simpler materials first. You also might consider asking questions if you’re using the playlist to create an exploratory learning experience. MentorMob is extremely easy to use so it’s a good tool to for students as well. As noted, MentorMob’s in alpha, so you may see changes as they collect feedback and develop the platform. Curious about what others are sharing? Browse the playlists.